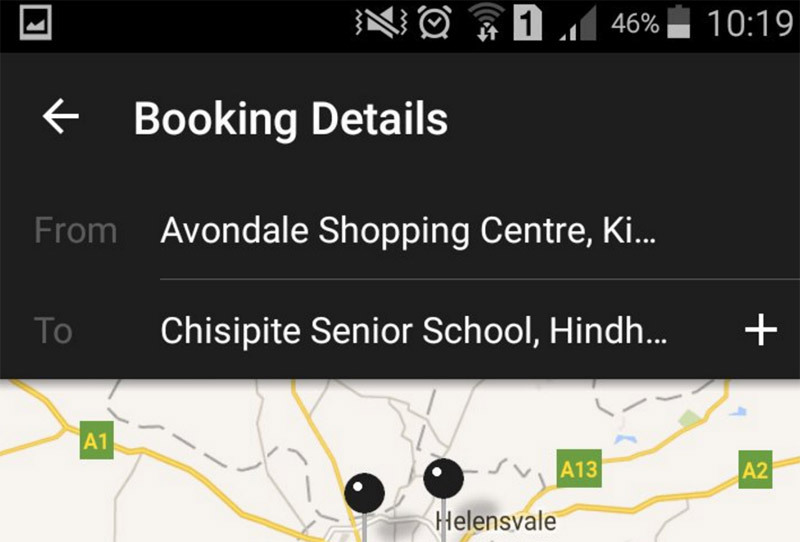 GTaxi Zimbabwe is a classy, brand new app offering on-demand cab service in Zimbabwe. The startup aims to bring both “convenience and predictability” to the local taxi industry where traditional operators are not delivering both quality service and affordability to travelers. GTaxi launched three weeks ago in Harare, and founders say the company is already planning to make a swift expansion into Bulawayo and Victoria Falls. At the March 31, 2016 launch, the startup unveiled its app that runs on both Android and iOS platforms. The app is simply designed and beautiful, themed with the black and white colors of the GTaxi logo. Its UI allows a user to tap the “G” home button on the screen, after which the app determines the client’s location. 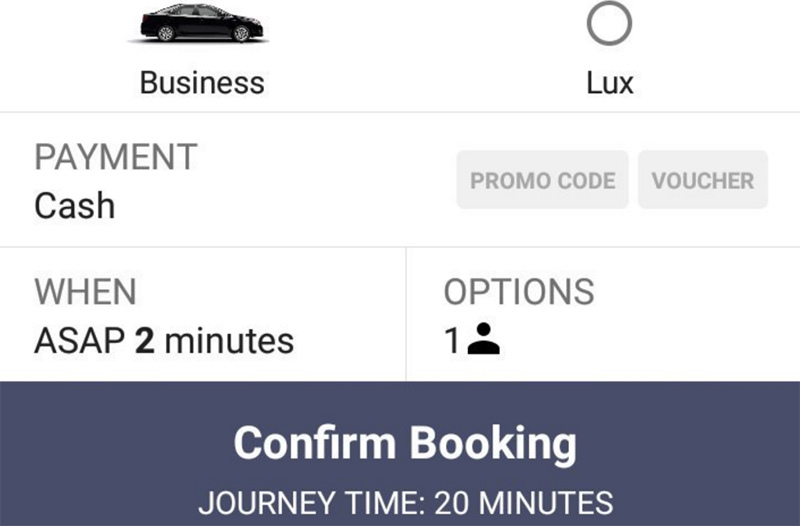 The app then provides a fare estimate, based on the distance to be covered, and dispatches the nearest cab to the client while providing real-time status of the vehicle location. When their cab arrives, the customer receives a notification on their mobile device. 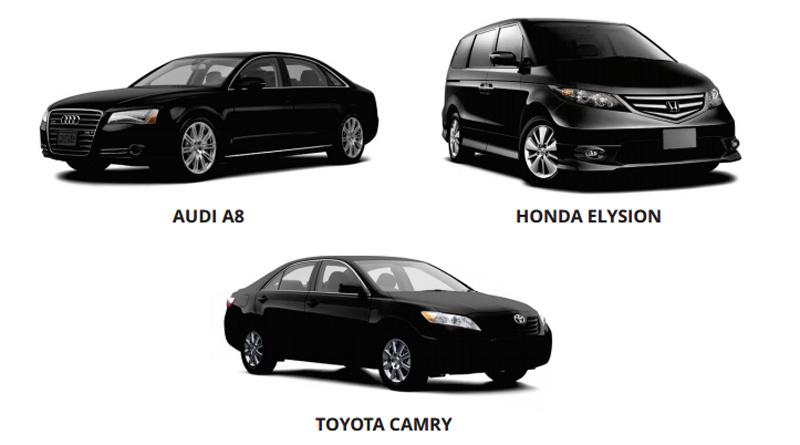 GTaxi managers have differentiated themselves from popular models in their line of business, such as Uber. Even if the highly-disruptive American startup were to set up shop in Zimbabwe, GTaxi would not consider them as competition. That cash-paying option is great, and fits well with the reality that although the Zimbabwean market is often dogged by liquidity challenges, cash is still the primary means of exchange in a country whose population is yet to take up credit and debit cards en masse. But cash fortunately isn’t the only option on the GTaxi menu, because the service also allows credit and debit card payments. It’s not clear how exactly Zimbabwean market is not ready for the outsourcing approach, given the multitude of under-utilized mshika mshikas on and off the roads in Harare, but we’ll give GTaxi a benefit of the doubt as they seem to have bothered with doing bottom-up research in just about every other aspect of their business. I also find these claims fathomable, as the quality of the fleet has already been confirmed anecdotally to us by two different people who have used GTaxi and found its service to be a cut above the rest. Indeed, with have over 1200 app downloads and over 100 unique users after only the first month of operation, the startup has really hit the ground running. “The good news is that almost everyone who has tried the service once has become a regular customer,” a company representative said. GTaxi thus looks like a welcome addition to the solutions we currently have on the market for transportation, handy and offering a comfortable, classy experience whenever the family car is broken, when out late having loads of fun, or when hosting big events and business functions – especially those that have some international scope – where certain important individuals have to be ferried in a classy business-class vehicle from a reliable service provider. You can download the GTaxi app on Google Play by following this link. The GTaxi Zimbabwe Facebook Page is here. Download their pricing schedule here. Nice app. definitely trying it . Nice app. I have noticed the vehicles have yellow number plates. I thought all public transport vehicles including taxis are supposed to have red on white number plates. Or is GTaxi operating outside the confines of the applicable regulations and laws. Looks like their website does not yet include pricing/rates; the website looks like it might be a work in progress to me – doesn’t have info about the service, founders/team, etc – and other important stuff.The site still functions with the basic UI of the app. But we’ve uploaded their pricing schedule here: http://www.techzim.co.zw/wp-content/uploads/2016/05/Pricing-GTaxi.pdf and there’s also now a link at the end of the article. GTaxi provided the schedule. Great service, but if you DON”T wanna be seen as an Uber wannabe then how about NOT using Uber’s logo just rotated 90 Degrees – just a thought…..
That’s something I hadn’t noticed at all.. interesting observation. For a moment l thought this is a service worth noting but then reading on l realised its just a company bringing a better customer service in Zim which is long lost. Im not seeing anything worth noticing. In other parts of the world, this is a standard practise. You choose the car you want, time you want it and you will be informed when the car is on its way and when it gets to your house. Most taxes now have also this app feature. It might be something new in Zim but definately not anything new in other parts of world where the economy functions normally. What would have been interesting is to drill down into more tech bits. Whats happens if you phone cannt lock gps? How do you keep track of your booked taxi. What algorithm do they use to calculate fares, is it by gps coordinates or road followed? What happens when the car loose gps connection before you get to your final destination? Do you need internet for the app to work? I’ve not used the app but lets give credit where credit is due. They’ve introduced a good service in Zim, and one that actually works. Moreover, they’ve incorporated some tech into their service offering and this will help them to scale up at the appropriate time. A friend used the app last night when they got unexpectedly inconvenienced on their way home – true to their word, the taxi arrived, drove them to their home and at the estimated fare. So hats off, and all the best. Lets see more home grown techpreneurs taking the risk to actually put their money where there mouths (or ideas) are! This is one of the best written apps I’ve seen for the local market. It’s simple and straight forward to use. Am yet to try use the service and see if it stands up to their claims. I’m not a developer (yet), but am wondering why most new app dont feature on AppStore (Apple)? Its always Google Play first and several months (or even years) later, it then features on App Store. Why is this nhai? as a startup u want a platform with many people so market share of ios relative to android is low, in hindsight i feel startups should start with a web app, then android then ios.